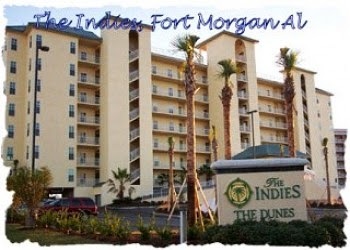 The Indies Condos in Fort Morgan Alabama are nestled within a quaint neighborhood on the beach. The Indies is a beach side resort, meaning there is no major road to cross. The walk to the beach is only a couple hundred yards. There is also an outdoor heated pool, hot tub and kiddie pool, roof top terrace, fitness center, business center and private beach access. Enjoy a private golf cart for the low cost of $225/ week or $50/ day. Subject to availability. Please include your request in the comments section when making the reservation. If available, we will add the amount for the days requested to your balance.